Every construction project requires the use of ladders or lifts. Because reaching elevated spots is necessary to the completion of a successful project, so are the rules for using ladders and lifts. Falls are one of the most common yet avoidable hazards in the construction industry. Protection from falls is required any time a worker is 6 feet above a lower level and following safety rules dramatically decreases the chances of a fall. Operating construction lifts can be very exciting. The two main types of lifts you’ll encounter are scissor lifts, which can go up to 80 feet above the ground, and boom lifts, which can go up to 185 feet. As you can imagine, going up that high requires extensive safety precautions. Boom lifts go up and away from the base. 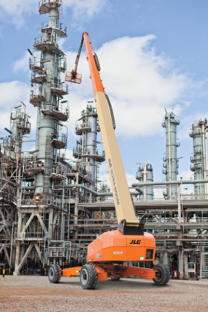 This is the JLG 185, the tallest boom lift in the world. It can reach a maximum height of 185 feet. 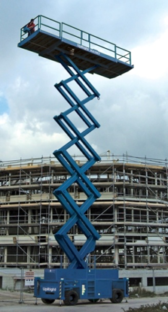 Scissor lifts go straight up from the base and can go as high as 80 feet. Ladders may seem like a simple tool, but without the proper precautions they can become dangerous. When using a ladder, there are many things you may shrug off or think you can get away with, but all it takes is one small slip and you could be seriously injured or worse. If you find a ladder in poor condition, tag the ladder and take it out of service. If repairs are not feasible, the defective ladder should be removed from the job site. Nebraska carpenter Kevin safely uses a ladder at his jobsite. There are two common types of ladders you’ll see on the jobsite—straight ladders, which look like this: / and stepladders, which look like this: /\. Always set the ladder on solid footing against a strong support. Don’t set up ladders in areas such as doorways or walkways where others may run into them. If it’s absolutely necessary, place barriers. Always keep the area around the top and base of the ladder clear. Don’t run hoses, extension cords or ropes on the ladder. Don’t try to increase the height of a ladder by putting it on top of boxes, barrels or other materials. Don’t ever try to splice two ladders together. Don’t use ladders as platforms, runways or scaffolding. Check your shoes for oil, grease or mud and wipe it off before climbing. Make sure the side rails extend above the top rung by at least 36 inches. Place the base out away from the wall or edge of the upper level by 1 foot for every 4 feet of vertical height. Tie in, block or otherwise secure the top to prevent the ladder from shifting. Don’t use a straight ladder like you would a stepladder, and vice versa. Fall prevention safety rules and practices are not only important on the jobsite but anywhere the equipment is used. As a group activity, consider ladder safety on the jobsite, in building maintenance at your school, or in your home. Working in the construction industry and using these types of equipment continues to be an exciting and rewarding career choice!